Agricola Redesign | Five Ideas for Planning the Best Father’s Day Yet! Five Ideas for Planning the Best Father’s Day Yet! We celebrated moms last month, and now it’s time to celebrate the dads! Father’s Day is just around the corner, on June 18, and we know that you want to make this day just as special and he is! 1. Run some errands. Take the pressure off dad by offering to run some errands for him. Whether it’s stopping at the grocery store, running to Home Depot, or dropping something off at the post office, errands are a great (and free!) way to make him feel special. You may also want to take on some of his chores around the house and give him some time to relax. Mow the grass, do the laundry, and clean the bathroom – he’ll appreciate it more than you know. After you run errands and do chores, take dad on a walk through one of our city’s amazing communities and explore a new part of the city you’ve never been before. 2. Plan a BBQ. What dad doesn’t love a good BBQ? Go above and beyond this Father’s Day and plan dad a special BBQ. There’s really nothing quite as relaxing as having someone prepare a meal for you. Show dad all that you’ve learned from him and his BBQs over the years and whip up chicken, hotdogs, burgers, and more! 3. Go on a brewery tour. Cincinnati is known for its breweries. Why not explore that part of the city with dad? There are several breweries throughout Cincinnati, including Rhinegeist Brewery and MadTree Brewing, that are putting the Queen City on the craft beer map. Several breweries in the city also offer tours to give you a sneak peek of what goes on behind the scenes! 4. Celebrate him as a grandpa! It’s always nice to let your parents know how much you appreciate them, but if you have children of your own, consider creating a photo book full of pictures of his pride and joys. Trust us, he’ll love having a book to bring along to the golf course and events to brag about his grandchildren and how adorable they are. It’s not just a gift that you can create yourself either, have your children help you out, too! Let them make a few squiggles if they’re younger or encourage the older ones to create a page of their own to put in the book. 5. Give dad a sign. While a piece of home decor may not seem like the most thoughtful gift for dad, it can be perfect! If dad loves signs or clocks, surprise him with the perfect items to help him makeover his man cave! 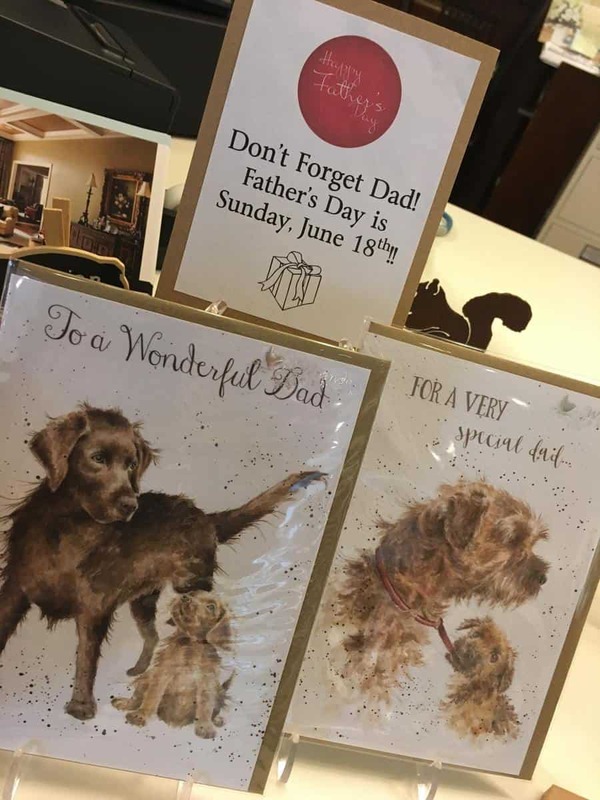 When you’re shopping for the dads in your life, visit A Village Gift Shop at 3 Village Square in Glendale. We have tons of great items for dad. Shop our Mud Pie grill master platter or snag a Mona B. beer bag. We even have the perfect items for grandpas in our baby section! Has dad been talking about making some updates to his home? Contact Agricola Redesign at 513-771-3927 and purchase a gift card for a design consultation. We’ll help dad figure out what he wants to do with his house and where he can most utilize an update!